Day after part of the Majerhat bridge between Taratala and Mominpur collapsed in south Kolkata, rescue operations are still going on Wednesday. According to official figures, one person has died so far and 19 others sustained injuries in the major accident. Teams from the Kolkata Disaster Management Department, the National Disaster Response Force (NDRF) and the state fire department conducted the search and rescue operations throughout the night at the Majerhat bridge collapse site to find those possibly trapped under the debris, officials said. Chief Minister Mamata Banerjee, who is now in Darjeeling, is expected to cut short his visit and return to Kolkata on Wednesday and visit the site. She has ordered a probe. 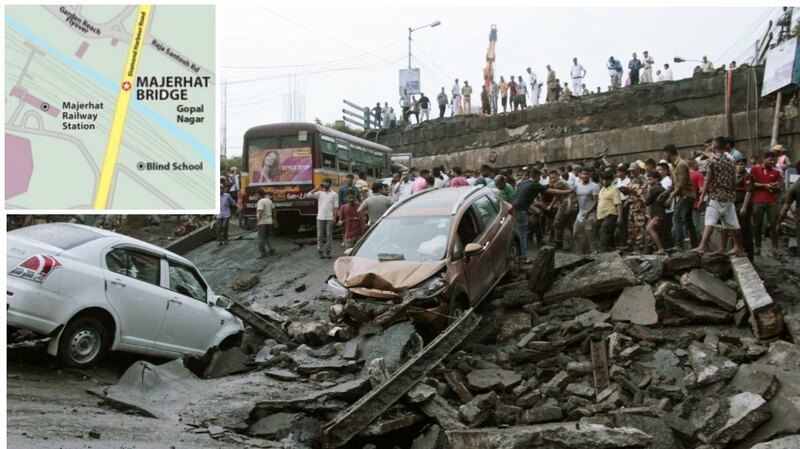 A section of the over 50-year-old bridge on the arterial Diamond Harbour Road in south Kolkata collapsed Tuesday evening, trapping several people and crushing many vehicles. Even as rains and low light made the search and rescue task difficult, the rescuers tried to drill the concrete slabs, using sophisticated cameras, and engaged sniffer dogs to ensure anybody trapped under the rubble could be found. Additional lighting arrangements were made for the rescue team to work at night, said the officials. “There could be a few trapped underneath the collapsed bridge. We are trying to find them out. We are using cutters and drill machines to cut through the concrete slabs of the bridge. Till now, we are unable to locate anybody. We are trying our best,” an official of the rescue team said in the morning. A mini bus, four cars and a few motorcycles were removed from the debris using cranes, the official said. The area near the site had been dug up for a Metro railway project and construction material are strewn all over the place. Labourers working on the project said two of their co-workers, who were probably inside a temporary shelter under the bridge, were missing. The police had identified the deceased as 27-year-old Soumendu Bag. The injured are undergoing treatment at SSKM and CMRI hospitals in Kolkata. The state government will pay a compensation of Rs 5 lakh to the family of the deceased. The Majherhat bridge connects extended areas of South 24 Parganas district to Kolkata. Traffic has been diverted to other routes. Tram services have been completely suspended along the CGR Road-DH Road and Judges Court Road, he said. Goods vehicles have not been allowed to enter the city between 6 am and 11 pm. The Metro railway authority, however, has ruled out any such possibility. “Investigations are going on. At this point, we cannot come to any conclusion regarding the possible reasons behind the accident,” a member of the forensic team said. This is the third bridge collapse in the city in five-and-a-half years. An under-construction flyover had collapsed in crowded Burrabazar area, the wholesale business hub of the city, on March 31, 2016, claiming 26 lives. Amid blame game over the partial collapse of the bridge, the Eastern Railway said it was not conducting any maintenance work at the accident site. However, experts said the bridge was very old and any structural defect or use of inferior quality of material as the reason behind the collapse could not be attributed. Urban Development Minister Firhad Hakim said on Tuesday heavy construction work as part of the Metro project next to the Majerhat bridge could have weakened its pillars. According to a state official, the bridge was constructed by the Kolkata Port Trust and maintained by the PWD. Meanwhile, BJP MP Roopa Ganguly paid a visit to the site early Wednesday morning. She held the state government responsible for the mishap alleging that the bridge was not maintained properly.